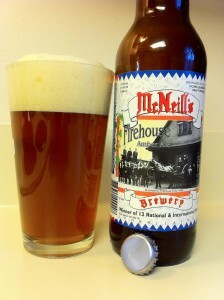 McNeill’s Firehouse Amber Ale has a nice hoppy aroma. The flavor starts with bold malt bite with a hoppiness mixed right in with the initial flavors. The beer may be past it’s prime as the “best before last day” mark is on August. I purchased it in October so some distributor most likely or a retail wasn’t doing their job. The beer had a lot of suspended particles. But, the beer didn’t have any strong off flavors. There was a little tangy flavor in the back of the mouth. Hopefully, I will get a chance to try a fresher batch in the future.